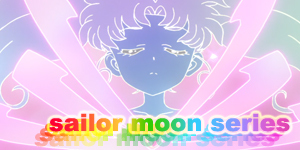 Well, here we are, the first episode of Pretty Guardian Sailormoon. The live action action/drama based on Naoko Takeuchi's hit manga and anime series. As with most first episode's this one introduces us to the main character as well as select members of their supporting cast. What's interesting about PGSM is that not all the supporting characters are introduced right away. As it is we are introduced to Luna, Sailor V, Tuxedo Mask, Mamoru, Usagi's mother and brother, Naru and only two of the villians; Queen Beryl and Jaedite. Oh, and Ami makes a one second cameo. 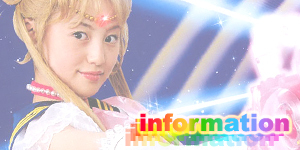 Rei, Mokoto, Minako, Artemis, the other three generals, Queen Metalia, Motoki and the two live action only creations, Sailor Luna and Mio are introduced gradually throught the run of the series. Hell, Queen Serenity doesn't make an appearance until the Special Act! This makes for interesting viewing as the writers never reveal their hand until they need to, causing lots of speculation among the viewers. Act 1 (PGSM doesn't include episode names ala the anime. 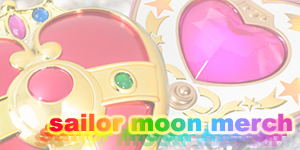 Instead, all are numbered "Act _") begins with a confrontation between Sailor V and Tuxedo Mask over a bag of jewels. Sailor V seems to win the fight and then chases Tuxedo Mask down the street. The Opening Credits now begin. Fans of the anime can guess what follows. Usagi is seen sleeping in, wakes up late and freaks out. 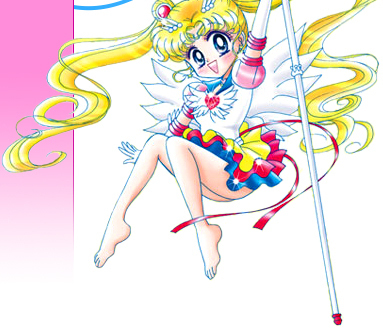 On the way out the door, she stops to catch a news report concerning Sailor V and comments on how cool she is. As she's running to school, a toy cat falls out of the sky and lands on her head. Usagi throws her off and continues running to school. 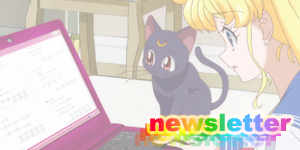 What Usagi doesn't know is that after she ran away, the "toy" cat became alive and started walking around. The toy cat was Luna! 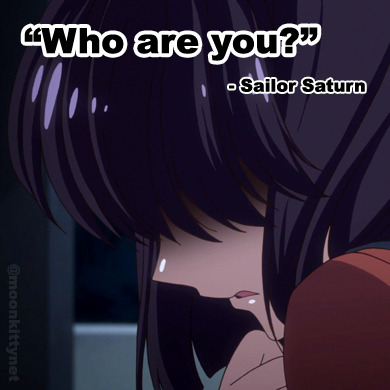 After arriving late, Miss Haruna scolds Usagi and asks why she can't be more like Ami. Naru finds Usagi getting in trouble very funny and decides to help Usagi out with her punishment, i.e. cleaning the classroom. After class they go to Crown (which is a Karaoke Club rather than a video game centre as in the manga and anime). 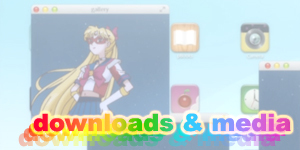 That night, Luna visits Usagi and explains to her her destiny and gives her her special phone. Unfortunately, Usagi thinks it's just a dream. The next day, Usagi and Naru go to Naru's mother's jewelry shop which is having a fashion show (go figure). 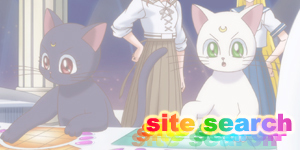 Luna is also there, looking for her Sailor Soldier. Usagi runs into Mamoru who is there looking for "something" and eventually we find Naru's mother had become possessed by a Youma working for Jaedite, who also makes an appearance. Naru realises this woman isn't her mother, but before she can escape Jaedite zaps her with his finger, rendering her unconcious. Usagi who had "felt" that Naru was in trouble is found trying to get into the jewlery shop by Luna who finally gives Usagi her Make Up Broach and Lipstick. She then tells Usagi to use her phone to disguise herself as a model. She does so and once inside, transforms into Sailormoon and defeats the Youma. Jaedite tries to kill her but she is saved by Tuxedo Mask. Naru wakes up. Usagi comments on how nervous she is and yet so excited and in the Dark Kingdom, Queen Beryl plays with fire and is pretty pissed off. 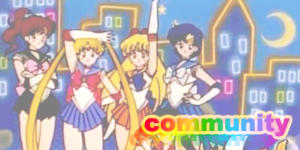 We are then shown a montage of Sailor V, Sailor Venus, Sailor Mars, Sailor Jupiter, Sailor Mercury, Tuxedo Mask and Jaedite. The adventure has just begun. 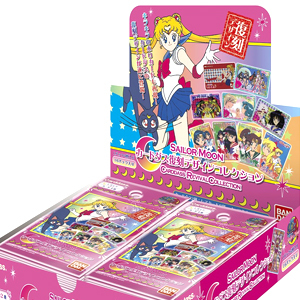 First appearances of (if you don't count the opening credits or the bumper at the end) Usagi/Sailor Moon, Luna, Naru, Ami (is not yet Mercury), Ikuko Mama, Usagi's brother, Queen Beryl and Jaedite and Miss Haruna. First time attack for the classic Moon Healing Escalation.